Better together or going it alone? 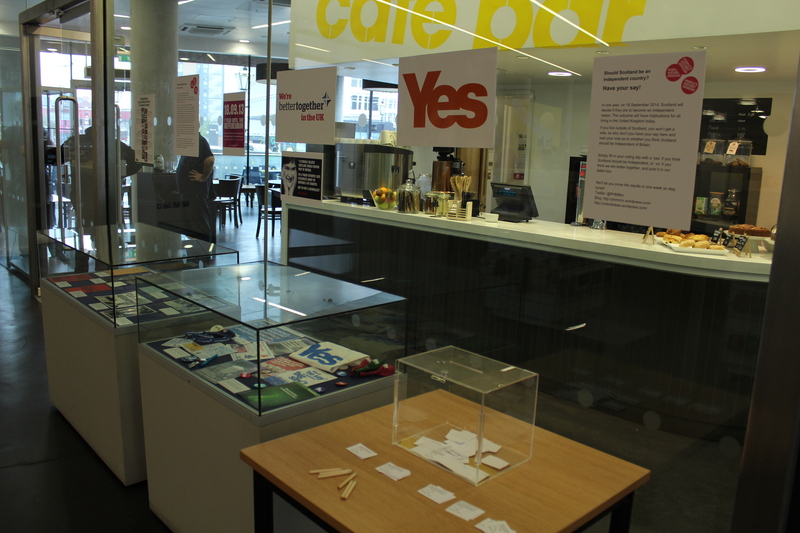 Scottish Referendum display at the PHM. Today Scotland votes to decide on whether they will be an independent country. Last year Harriet Richardson wrote this blog post about our collections related to this issue. Please note that this was originally published on 19 September 2013. You can see how our visitors voted here. Yesterday marked one year to go until Scotland will vote to decide the future of their country…are they better staying within the UK or will they decide to become independent and go it alone? In honour of this momentous question, which will inevitably affect all living in the UK today and most people have an opinion on, we decided to search through our collections and review the history of this debate, while presenting material from both contemporary campaigns; Better Together and YES Scotland. The first stop was our very own Archive and Study Centre to look at material surrounding the history of this story. Since the Act of Union in 1707, groups within Scotland have advocated for a separate Scottish Parliament, known as devolution, or complete independence from the United Kingdom. 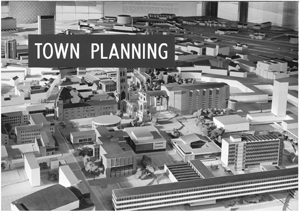 The first vote on devolution was held in 1979. Despite a majority of people voting ‘yes’ the act required 40% of all people in Scotland to do so, as this did not occur nothing changed. The second vote for devolution took place in 1997and this time Scotland did vote yes. Devolution brought a Scottish parliament with powers to legislate over health, education and housing, but not economic policy, defence or foreign affairs. 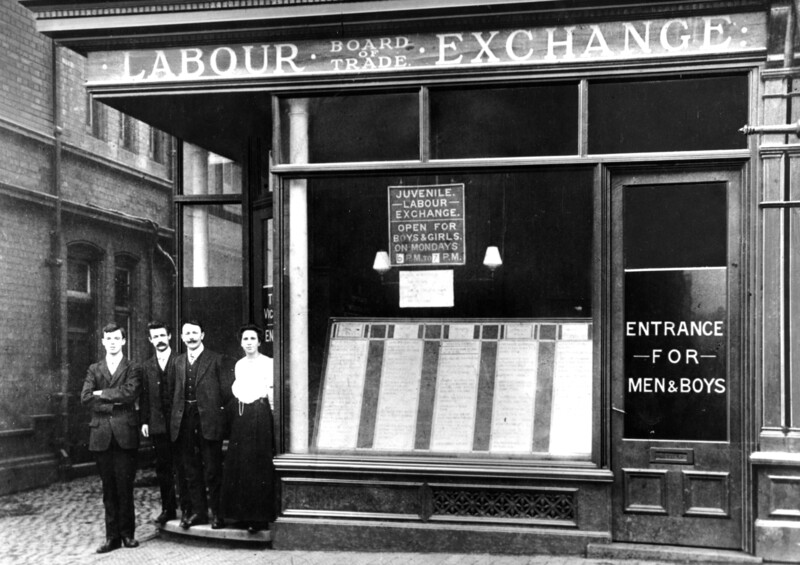 We were able to piece together pamphlets, leaflets and photographs from the archive and the Working Class Movement Library and create a case which charted the long history which will result in the referendum next year. 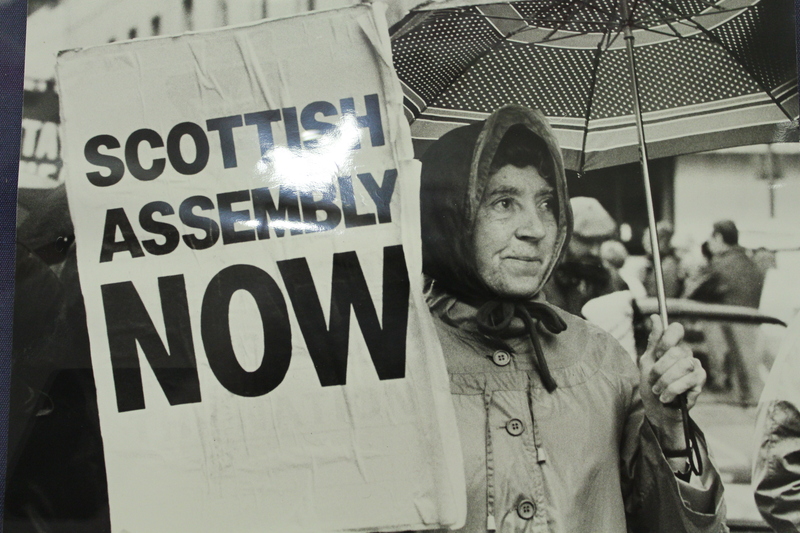 My personal favourite is this photograph of a lady campaigning for a Scottish Assembly in 1987- she looks to be there for the long haul, despite the bad weather! 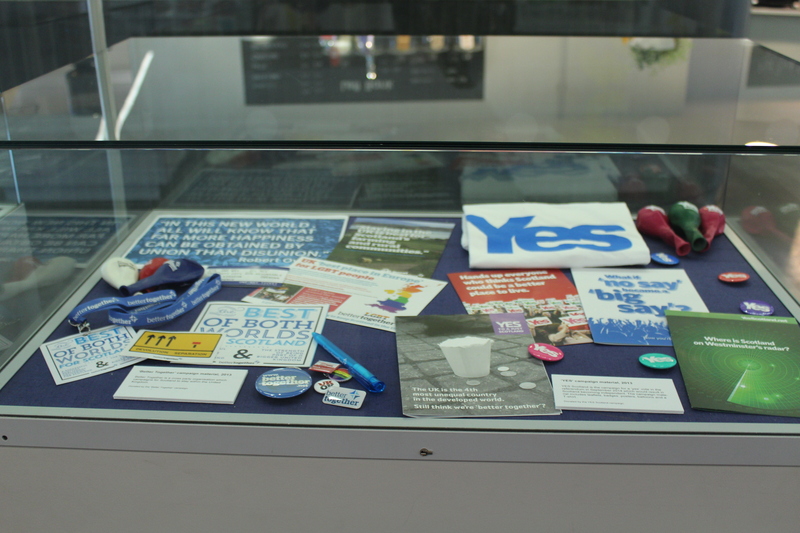 To bring the display right up to the present day, the very helpful people at both YES Scotland and Better Together sent us some campaign material including badges, posters, balloons, pens, leaflets and even a bottle opener/ key ring- always something to keep handy! These items were displayed in a separate case and the posters were stuck up on the wall bringing contemporary debate inside our museum setting. The ‘Yes’ Scotland campaign argues that a future under a social union will result in a much more equal society, because Scotland will be able to prioritise on matters most important to them. While the ‘Better Together’ campaign argue that were Scotland to become independent the country would be worse off economically, politically and socially. Unless you live in Scotland, you won’t get to vote in the 2014 referendum, although a ‘yes’ vote would radically alter what it means to be British. We thought therefore that it would be a great idea to use one of our new perspex ballot boxes, and offer our visitors the chance to ‘play their part’ and cast their vote. Visitors are asked the question which will be used next year; ‘Should Scotland be an independent country?’ and are asked to tick a ‘yes’ or ‘no’ box. 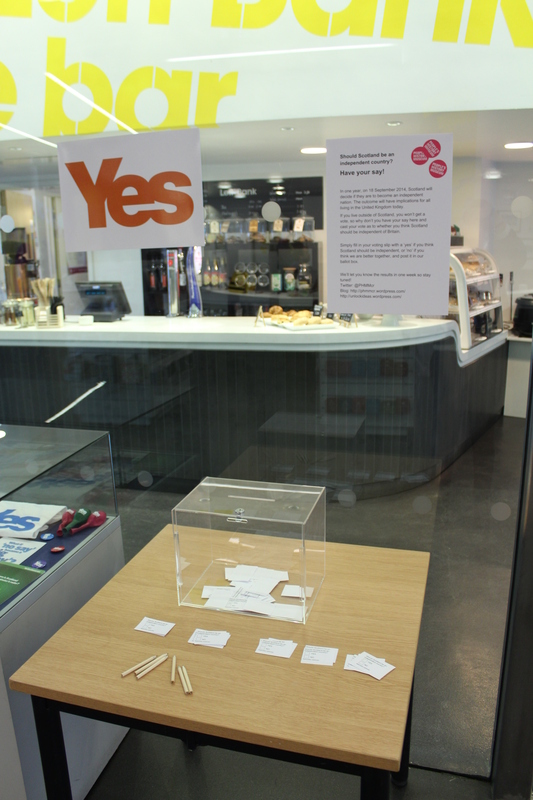 So far we have had loads of votes, and the display has only been up one day! We’ll tweet what the majority of our visitors have decided to vote for in the coming weeks, so stay tuned for our very own PHM poll. 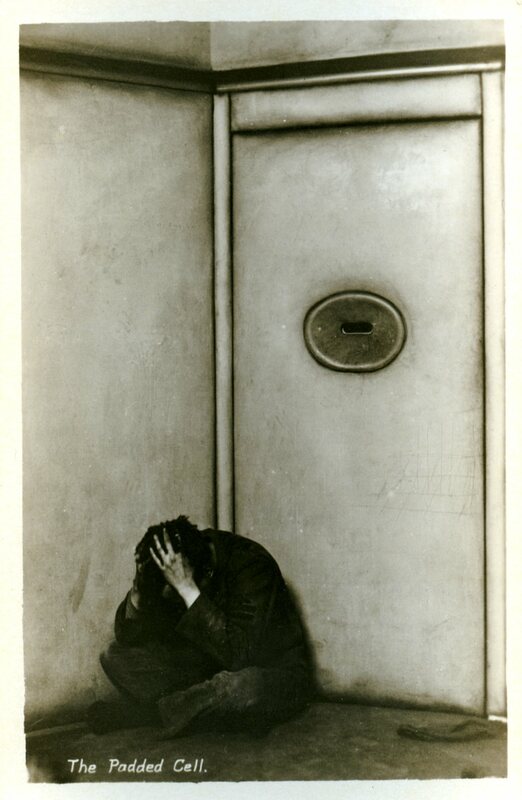 The first working Monday of every month brings a lunchtime Snapshot session down in the archive in the museum’s lower level. It’s an opportunity for anyone to have a look at some of the 80,000 photographs in our huge collection from the Labour Party and Communist Party archives in a friendly and informal setting. Because of the May Bank Holiday, please note this session is on Monday 12 May. 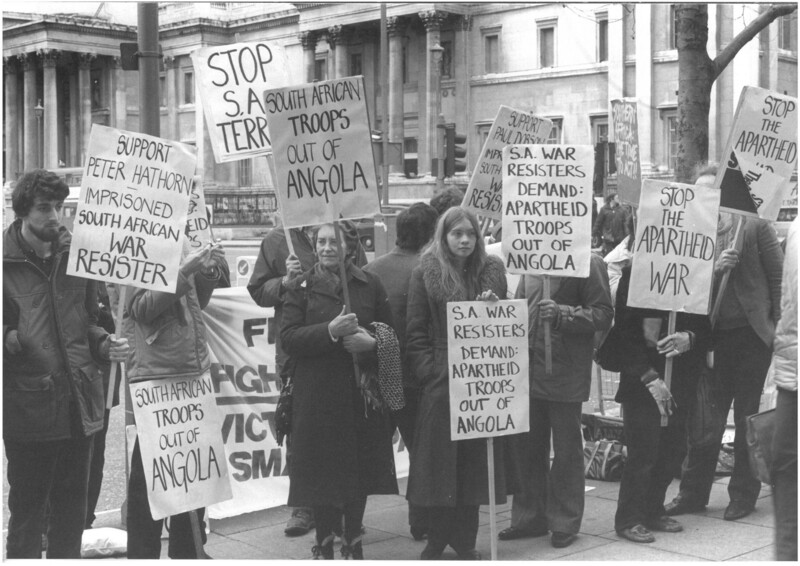 In this lunchtime drop in session, browse through photographs on the theme of the South Africa Anti-Apartheid Movement and uncover history through the lens. The People’s History Museum (PHM) is now showing a collection of pictures from our student campaign ‘Student Ideas Matter’. 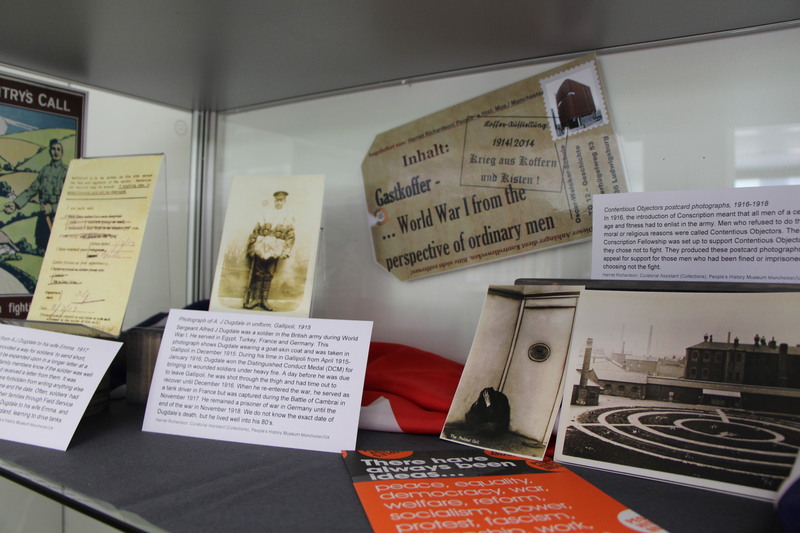 The display features a number of students, all from the Lancashire area, sharing their ‘ideas worth fighting for’. 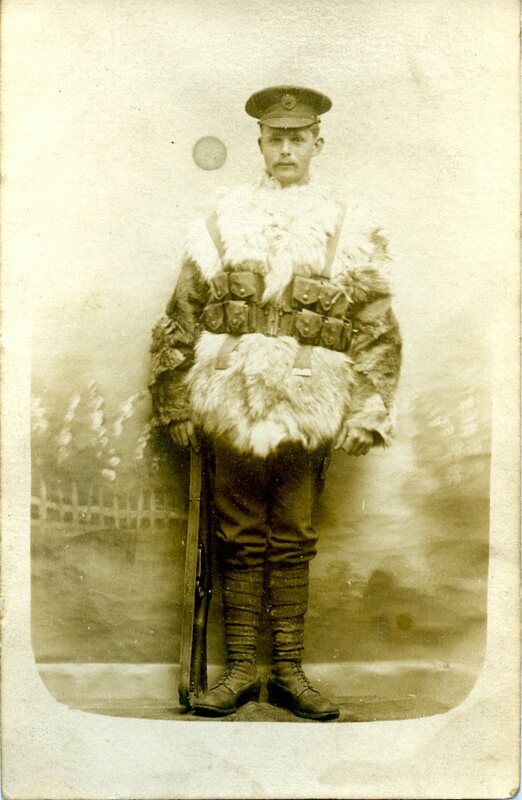 Come along to the museum, to see the photos in the foyer and Left Bank Café. 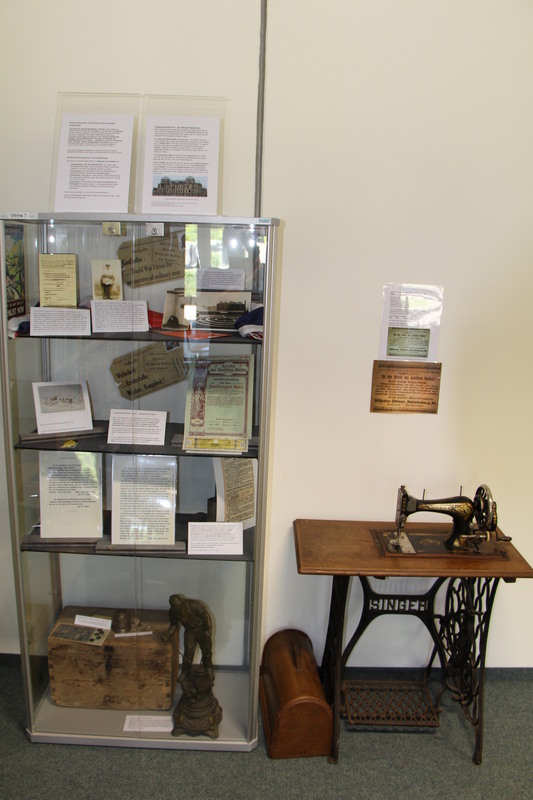 The display is a result of a partnership between PHM and the University of Central Lancashire. PHM kindly offered to collaborate with our group of PR students in September 2013, to offer practical work experience for us all. Since then, we’ve been immersed in conversation with students throughout the Lancashire area. We’ve been visiting Student Unions over the past month, collecting students’ ‘ideas worth fighting for’. There was a great response! Students from UCLan, Salford and MMU were excited to share their views. We collected a wealth of ideas, along with photos of the students. 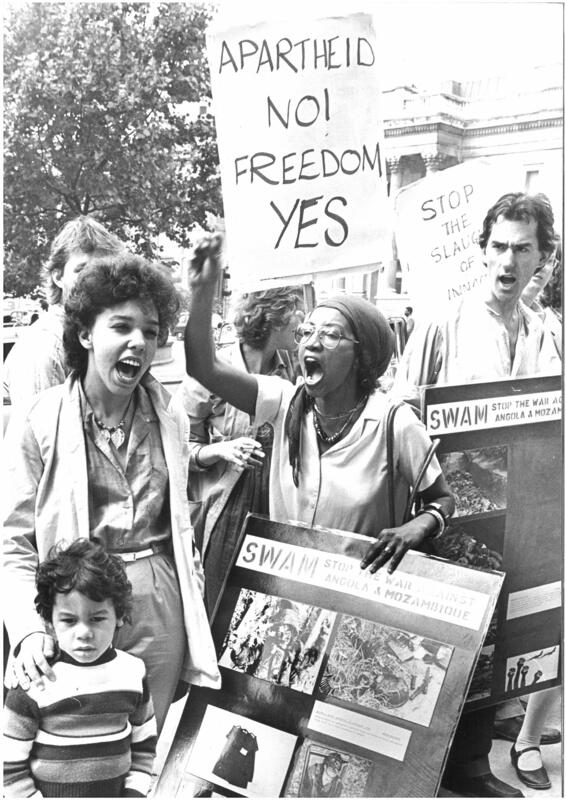 Ideas ranged from lower tuition fees, to free access to land and rivers. Overall, we talked to around 500 students throughout our three visits. Many were delighted to hear of the museum and its efforts to reach out to students. ‘Student Ideas Matter’ was essentially an Instagram photo competition, with the best ideas being chosen for display in People’s History Museum. The winners have been chosen and they are up for everyone to see! They will be up on display in PHM’s foyer until 30th April. The campaign was designed with the museum’s values in mind; democracy, equality, peace and welfare all being at the centre of the ideas. The UCLan PR consultancy planned ‘Student Ideas Matter’ from day one, and all ideas were our own. We are all very proud of what we’ve achieved, and thankful to PHM for giving us the opportunity. But the show goes on! We’re continuing to work on the project until May, and hope to leave PHM with improved student relationships. So, if you want to continue the conversation, use the hashtag #PHMStudentIdeas on Twitter, Instagram or Facebook. We’ll be looking out for you! Come and find out what matters to us students. We will fight for our ideas to be heard. Emma R., Bernie, Fiona, Greta and Emma U.